Location: Antequera, Spain. 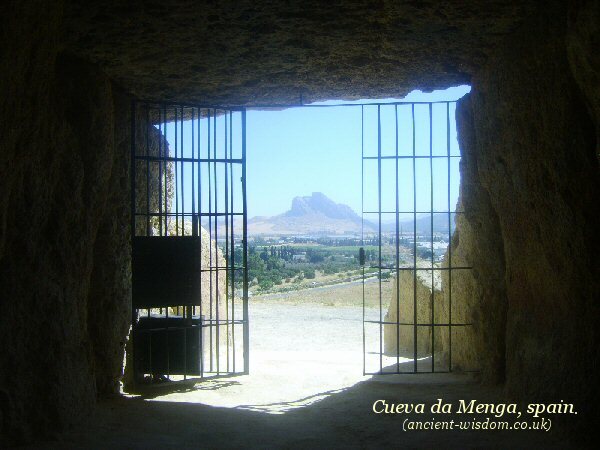 Grid Reference: 37° 1' 28.51" N, 4° 32' 47.38" W.
Cueva de Menga Complex: (Passage Mounds). 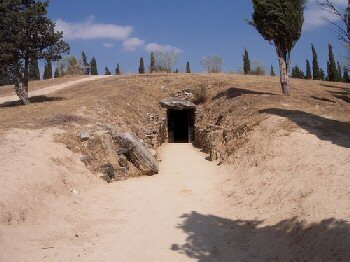 The tombs have been cleared out by tomb raiders long ago, and the few remains are now on display in the Museo Arqueológico (Archaeological Museum) in Málaga. The museum is located in the Alcazaba, the maurean residence. 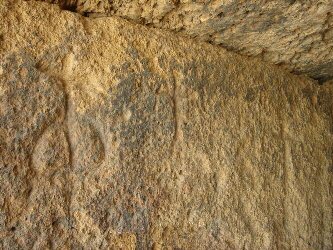 The stone used comes from de la Cruz, about 1 mile from the site. 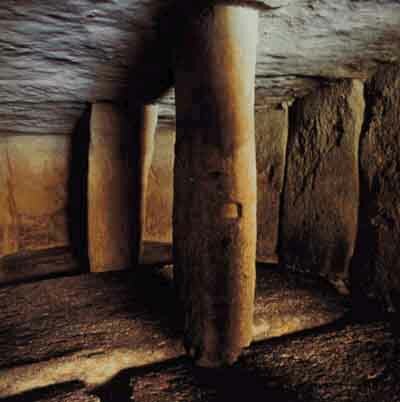 (2) The monuments are unusual in that they were partially cut into hillsides and each is constructed differently. 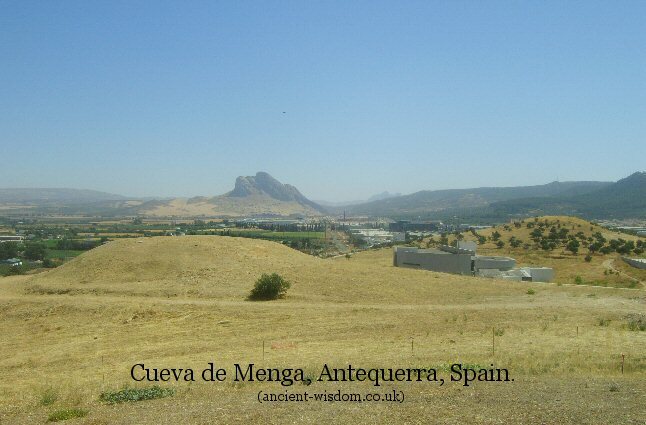 The view of the Cueva de Menga front left, the location of the Neolithic settlement centre right, and the ever-present Pena de los Namorados in the distance (As seen from the top of Cueva de Viera). From below, the passage mound appears to be a part of the natural mound.. 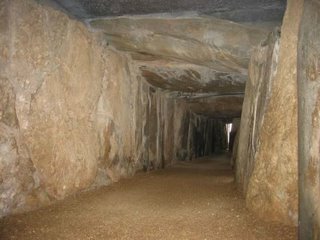 The ever present 'head' lies directly in front of the Passage mound, and is also aligned with both Cueva de Menga and Cueva de Viera. The 'anomalous' orientation of the passage mound, facing northeast (azimuth 45°), to the north of the summer solstice sunrise. In the context of the monument (and other contemporary monuments), appears to be explained by its alignment with the ever-present La Pena. 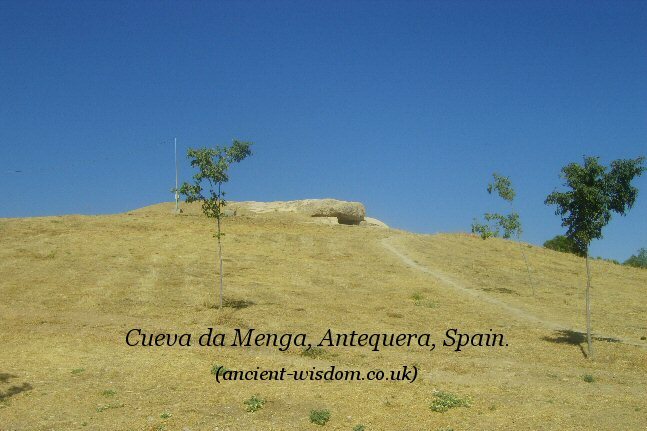 This text from 1854 is one of the earliest descriptions of the Cueva de Mengan site. Three pillars support the huge limestone conglomerate capstones, some of which are already noticeably cracked and broken. 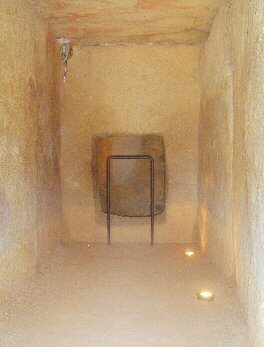 The well-shaft inside the chamber (left), and 'anthropomorphic' engravings (right). 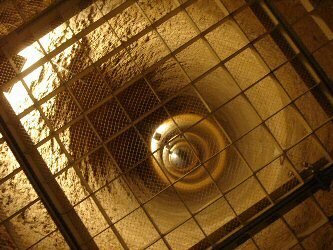 The well-shaft , which is 1.5m diameter and 19.5m deep, has water at the bottom. it was uncovered through recent archaeology. 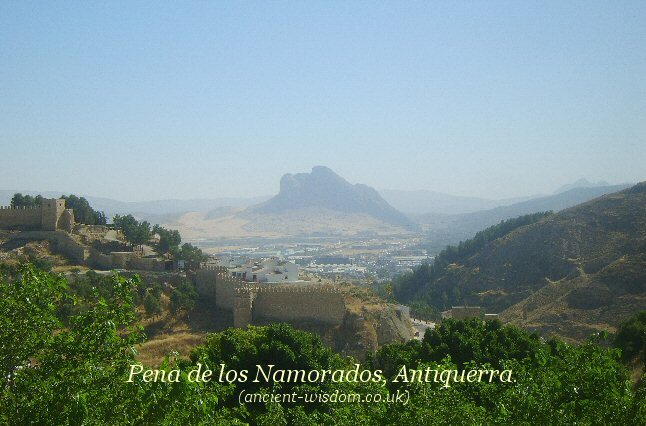 The entrance to the monument faces the 'Pena de los Namorados' (Lovers Peak). 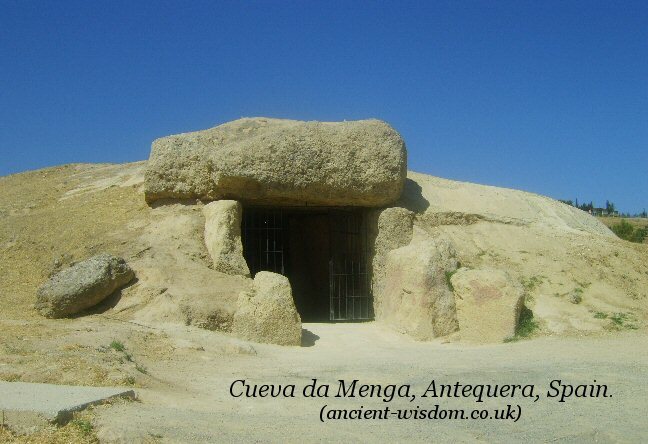 It is reasonably clear that this peak was a primary consideration in the selection of location for the Cueva de Menga complex and this example of deliberate placement confirms the idea that the landscape itself was an important aspect of the Neolithic mind, as was the association between megaliths and 'simulacrum', a suggestion which infers that the rocks and earth were seen as living entities, which would have endowed the site with a special quality. 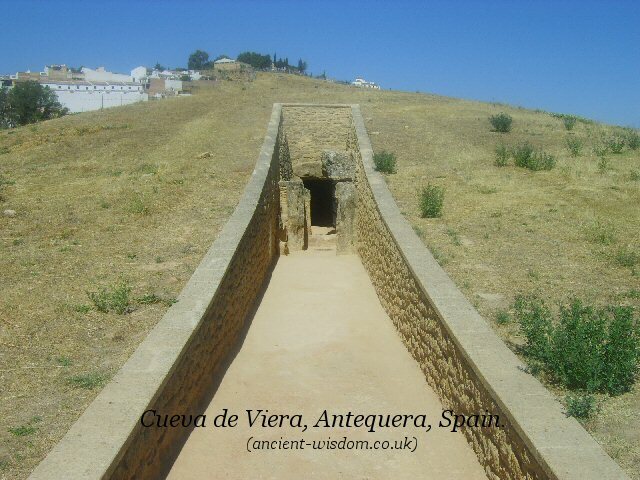 The Cueva monument is a passage mound consisting of a 22m long passage divided into two sections, at the end of which there is a small square chamber entered through a holed 'portal' stone. 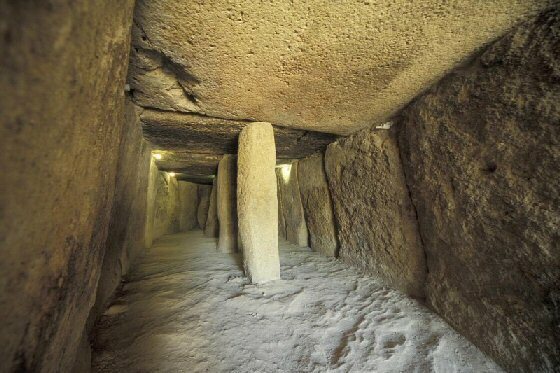 The stone interior is covered by a mound 55m in diameter and orientated along a 96° azimuth (a common theme in Iberian megaliths). The original structure had at least two 'Holed stones' in it, one now broken. 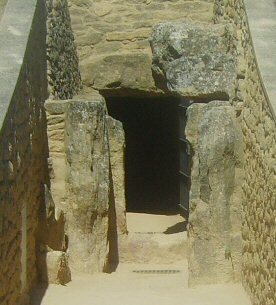 In the case of Cueva de Viera, one holed stone was placed at the entrance of the small inner chamber, and another part-way along the corridor. Their purpose is speculative, but one has to pass through them to enter. The Passage was orientated towards the sun at the autumn equinox. 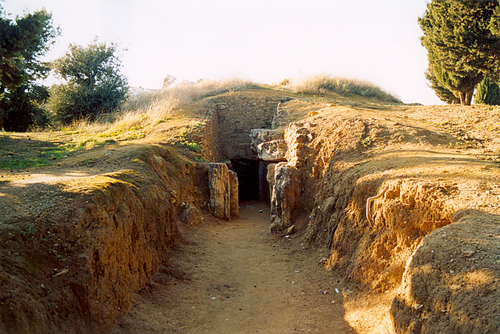 Cueva de Romeral: 'Tholos' / Passage mound. 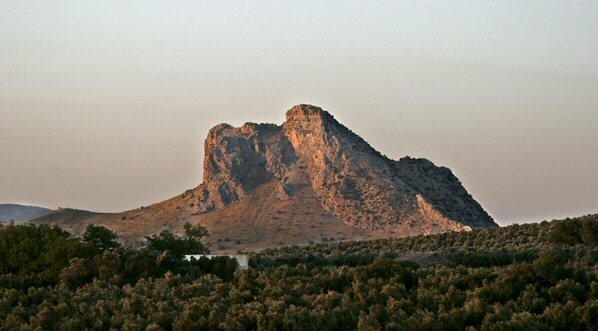 The tumulus is orientated on an azimuth of 199 , south south-west, towards the highest elevation on the El Torcal mountains, known as Camorro de las Siete mesas. 2). Edwin Oliver James. The Tree of Life. 1967. Brill Publ. 3). B. A. Kipfer. Encyclopedic Dictionary of Archaeology. 2000. Springer Publ. 4). M. A. Gallagher, A. Symington. Spain. 2004. Footprint Travel Guides.